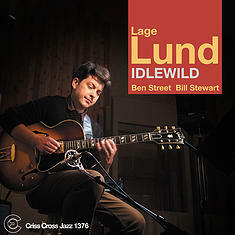 Along with label mates Mike Moreno and Adam Rogers, guitarist Lage Lund is one of the most distinctive guitarists on the current scene. His previous three Criss Cross dates have established his credentials as an up and coming talent of great promise. For his latest effort, he brings back to the fold his close associates Ben Street on bass and Bill Stewart on drums, both heard on Lund's previous sets, Foolhardy (Criss 1360) and Unlikely Stories (Criss 1321). The difference this time is that he forgoes the piano accompaniment for a bare bones trio approach that is quite refreshing and a further step forward. The mix includes a few originals and a nicely chosen selection of standards, including the iconic Bobby Hutcherson piece Isn't This My Sound Around Me .